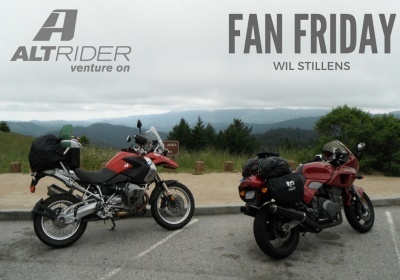 This Fan Friday we talk to Wil Stillens, 41, out of Riverside, California. Wil is a manufacturing engineer that specializes in 3D modeling, prototyping and manufacturing, as he makes tools, fixtures and a vast array of complex objects including medical devices, electric motors, fruit packaging equipment and parts for the off-road and motorcycle industry. Wil’s been riding a BMW R 1200 GS since 2007, after moving on from his cruiser and dirt bike phase. Before that he raced mountain bikes “almost professionally”, which is how he met his wife. Wil is currently the proud owner of a 2010 R 1200 GS (the first AltRider bike decked out at RawHyde by the way), a 2017 R 1200 GS Adventure, and a nice mountain bike with flat tires. “The GS is truly a magnificent machine- it is by far my favorite motorcycle. Lots of comfortable tarmac to technical dirt it will do it all. Keep on venturing and enjoy the ride.